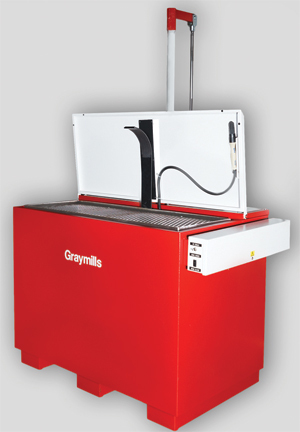 The new TL Series Liftkleen semiautomatic immersion parts washer from Graymills, Chicago, IL, offers operating capabilities and features commonly only found in high-end equipment, say company officials. The washer features heavy-gauge construction with durable powder-coated exteriors. For water-based applications, the TL Series boasts stainless-steel construction, an insulated tank and thermostatically adjustable heat to 180 F.
Powerful electropneumatic lift mechanisms provide 300 lb. of weight capacity with adjustable stroke and speed settings. Generous platform and tank dimensions accommodate parts as large as 47 by 18 by 24 in. An automatic open-and-close lid and deluxe, filtered detail brush and recirculation pump allow spot cleaning of difficult-to-reach areas. An available 3000-gal./hr. internal agitation pump for improved in-tank cleaning, and filtration and oil skimmer for fluid consistency round out the machine’s features.